Another Shearings Setra appeared at Great Yarmouth's Beach Coach Station this afternoon. Registered as BF10VCA and with fleet number 211, she was one of six vehicles there. A York Pullman coach and a double decker from New City Coaches were among the nine vehicles seen at Great Yarmouth's Beach Coach station this afternoon. 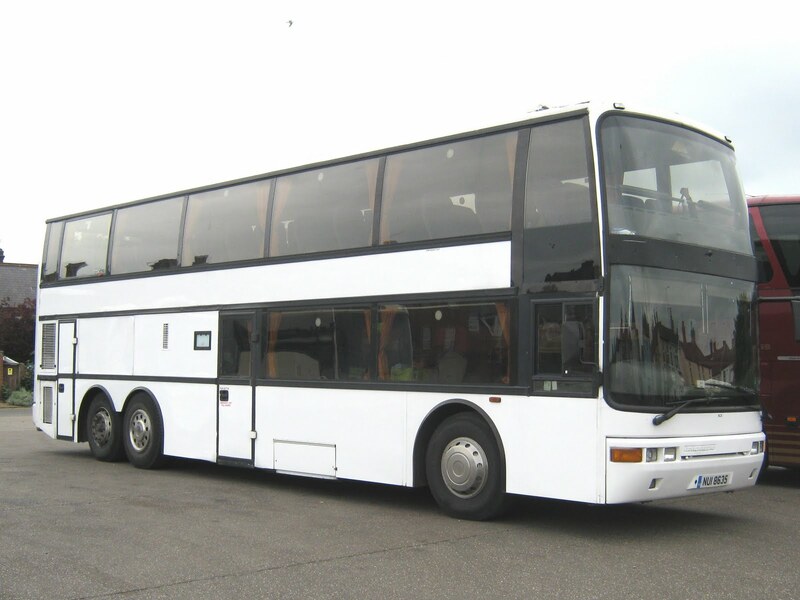 The York Pullman was a Van Hool with the registration of B18KJF. 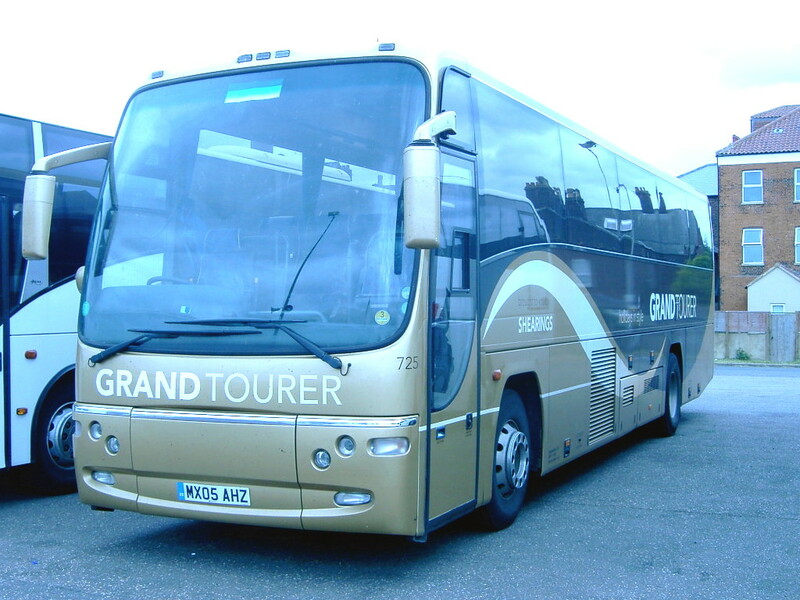 The vehicle is on hire to National Holidays for its Great Yarmouth and Norfolk Broads tour. The York Pullman name was resurrected by K&J Travel of Rufforth in April 2007 after the original trading name was sold to Hull City Transport after de-regulation. Finally, Whippet utilised Volvo J669LGA on its Coastal Service; which made a slight change from the regular J689LGA!! A viewing of Beach Coach Station yesterday revealed 14 vehicles present, including some interesting visitors. 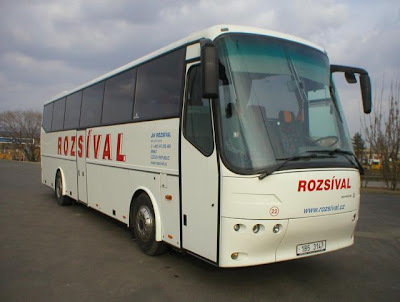 Also on site was a Czech Republic vehicle operated by Jiri Rozsival of Brno - unfortunately it was parked on the back rank so I was unable to get a reasonable photograph. However, a picture of the Bova Futura, which has a registration of 1B5 3147, was located on the operator's website and is reproduced here. 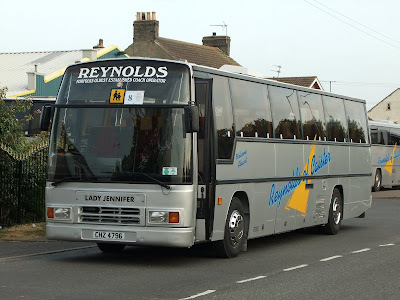 One vehicle I did get a photo of was a smart looking Rambler Volvo B10M with Van Hool bodywork. She was PDY272 which has fleetnumber 35. New to the East Sussex operator in May 1999 as T222GDY, she looked quite attractive in her mainly green colour scheme. 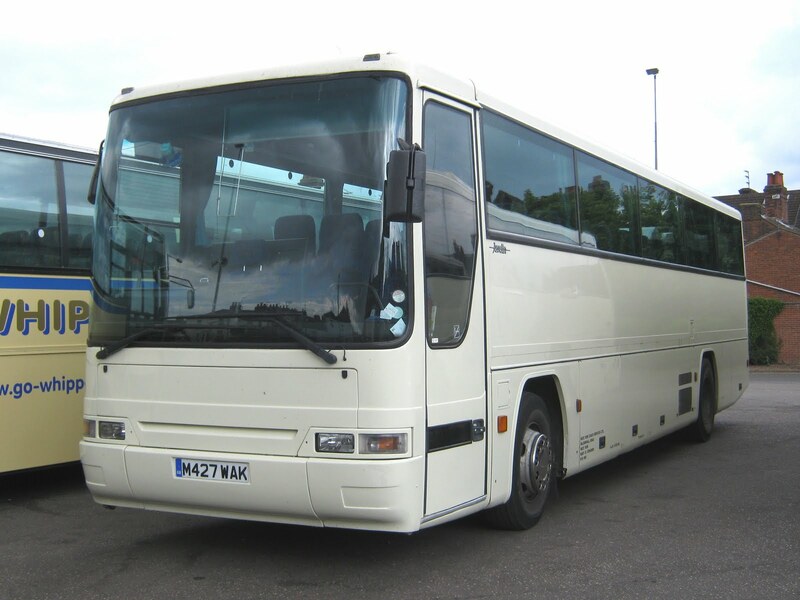 The operator's website also has details of current and previous vehicles owned and has been designed with the coach enthusiast in mind. Whippet's Volvo B10M J689LGA was there once more but was parked in a different spot to normal, which proves that it can and does move!! The 1997 green liveried Dart is pictured above working an afternoon schools service in January 2010 and is currently parked at the rear of Swift's Southtown Road yard, in company with 1992 Volvo B10 K224SSD. Both do not appear to have turned a wheel in weeks. The fourth posting today and its about Norfolk's oldest coach operator Reynolds of Caister. Local correspondent Grahame reports on the latest vehicle repaint at their Ormesby Road garage. Here Dennis Javelin CHZ4796 looks resplendent in its new coat of paint and its thanks to Grahame for providing the photo too. 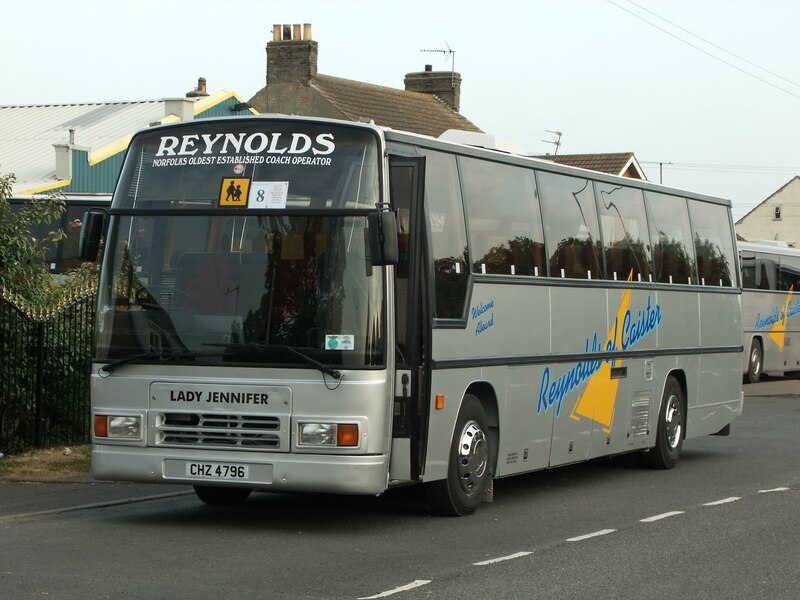 Reynolds operates 21 coaches from its Caister site and has recently launched a new web site which includes a photo gallery of some of its coaches. The weekday 13.20 Beccles to Great Yarmouth and the 14.10 return to the Suffolk town can often be relied upon to provide an Anglian StreetLite. Today was no exception with 324 MX60BWJ doing the honours. Here the driver gives a friendly wave to the camera as he negotiates the turn from The Conge to the Market Place in Great Yarmouth on the inward working. 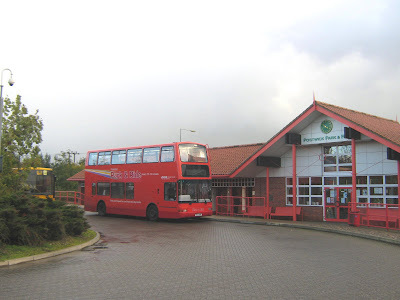 Thirteen coaches were in Beach Coach Station, Great Yarmouth during early afternoon. These included regular visitors National Holiday's 57 NH05CDH, Shearings' 217 BF10VCK and of course Whippet's J689LGA (once more!!) The trio are pictured below. Also present were three of Leons vehicles from Stafford who trade as Dunwood Travel. All three had travelled to the town from their temporary base at Gunton Hall in north Lowestoft. They were all subsequently seen late afternoon picking up their passengers at Market Gates for the return trip to their holiday accomodation. A Norse Trident, operating a Norwich park and ride service, caught fire close to Broadland Business Park on the eastern outskirts of the city yesterday evening. ﻿﻿﻿﻿One its ex London PN03 plated Tridents was returning from the City Centre on the 605 Postwick Park and Ride when the driver decided to evacuate the bus after seeing flames coming from the rear of the vehicle. Neither the 40 or so passengers or the driver were hurt. From a television report last night, the skeleton of the vehicle was all that remained. See Evening News Report which includes pictures and a video. This follows a First Eastern Counties Trident catching fire in the centre of Norwich only a few months ago. 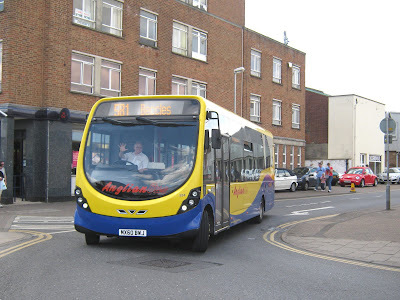 It appears that some of Anglian's StreetLites have returned from attention as two of them were seen in Great Yarmouth's Market Gates bus station yesterday afternoon. The first to put in an appearance was 325 MX60GXA and she is seen here leaving on the 14.10 581 Beccles service. She is passing First Eastern Counties 37572 AU58ECW which is about to continue with the 13.25 Lowestoft to Peterborough X1. Later in the day Anglian's 323 MX60BWK worked into town on the 581 15.20 from Beccles. Could this mean that Anglian will soon relinquish the loan of 326 MX60GXE and return the vehicle to Mistral soon? Colin White informs me that Lowestoft's First Eastern Counties 32211 LT52WTU was being employed on service 8 during yesterday morning. Not sure if this is a loan or a transfer. Finally Whippet J689LGA was on the Coastal Service again - just for a change! Stephen Gowler reports that the following were in Great Yarmouth's Beach Coach Station on Wednesday 11th May. 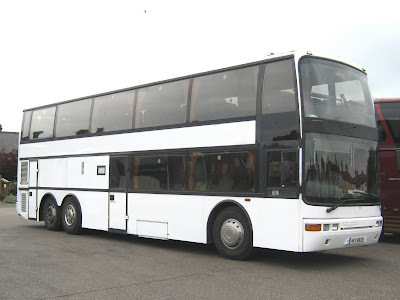 Stephen also reported that around 10.00 he saw First Eastern Counties 37571 (AU58ECV) and 37569 (AU58ECN) following each other south along Southtown Road, there appears something wrong there. On the X1 shorts thay day were 34109 (W436CWX), 66165 (W365EOW) and old timer Leyland Olympian 34333 (H132FLX). I went into Great Yarmouth by bus today and had the luxury of the front seat on the top deck of a First's President from Gorleston. As the bus turned into Southtown Road from the lights, I saw a white liveried StreetLite in the distance coming towards us. I quickly searched for the camera and placed it close to the window and took a photograph. The above picture is the result and is of AnglianBus 326 MX60GXE passing Bollard Quay on the 13.50 581 service to Beccles. She is on loan to the AnglianBus from Mistral whilst its own Streetlites are away for attention. Popped in to Beach Coach Station this afternoon and there was only coach present and that was Whippet's H19WCL which had arrived earlier on the Coastal Service. 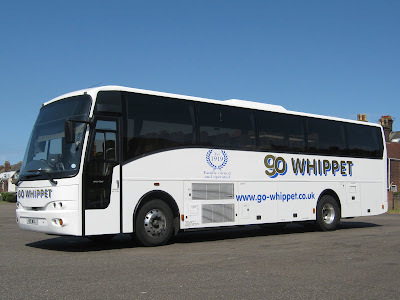 The Volvo B10M is in Whippet's 90th anniversary livery and was previously registered Y391KBN. Whippet's first weekday Coastal Service A was in the hands of Volvo B10M J689LGA - another regular visitor on the service last year. J689LGA is seen here at Beach Coach Station early this afternoon. Keeping her company was National Holidays Volvo YJ03VNB - fleet number 74. Later in the afternoon Shearings Setra 217 BK10VCK was noted unloading its passengers at the Carlton Hotel on Marine Parade following a days outing. With May Day being in the middle of the bank holiday weekend there were some interesting visitors to be seen at Beach Coach Station. 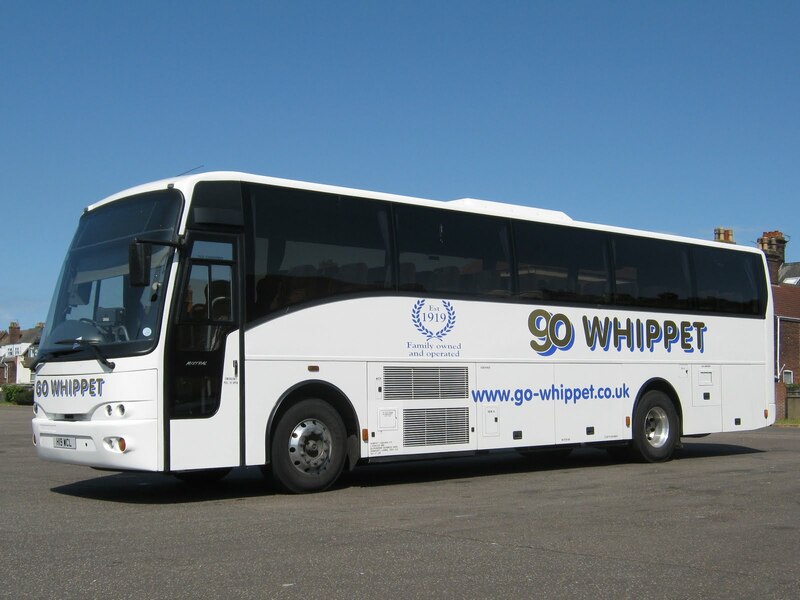 Today Whippet Coaches commenced operating its Sunday Coastal Service to Great Yarmouth from Cambridgeshire (Service G from Eaton Socon). Volvo B10M J669LGA performed the duty as it did on many occasions last year. She is seen here at Beach Coach Station in the early afternoon.